Jesus will return while the generation alive in 1914 is still around, when he will finally get the Kingdom underway. This is the ‘generation’ to which he refers in his prophecies in the bible; his return and the Kingdom coming to the earth will definitely happen while the 1914 generation is still alive. But hang on! A person born in 1914 – and there are some still around – is now 103, while those who were already adults in 1914 are long dead. 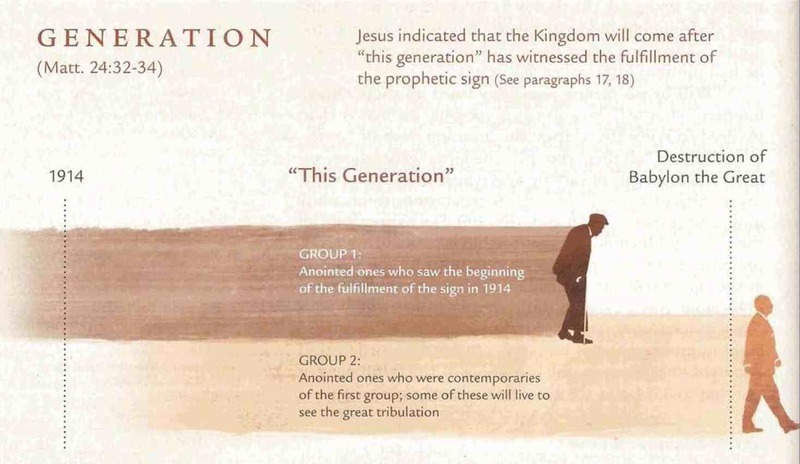 In other words, the 1914 generation has almost gone and there’s still no sign of Jesus or his Kingdom. Either he’s going to return real soon, before the last of the 1914 generation depart, or he’s going to miss the deadline yet again (Guess which it’s going to be). But worry not, Jehovah’s Witnesses have this one covered too! When Jesus referred to ‘this generation’ he didn’t just mean one generation, but to the generation that ‘overlaps’ with that generation. There’s nothing biblical about ‘overlapping generations’, of course. Jesus didn’t say, ‘the Kingdom will come while this generation and those that overlap with it are still alive,’ but like mainstream Christians, Jehovah’s Witnesses need to give Jesus and themselves an excuse if they’re to avoid admitting that he and they have got it wrong. So, an overlapping generation would be one like my own, whose grandparents were children in 1914. But we can extend this – and we can be sure JWs will once Jesus fails to return on time – because, using the same ‘reasoning’, my grandchildren’s generation ‘overlaps’ with my grandparents’ through me. My grandchildren’s grandchildren too will be connected with all previous generations, including that from 1914, because of those who have preceded them… and on and on, ad infinitum. In fact, Jesus could come back at any time in the future so long as someone is alive who can trace their ancestry back to 1914. But he’s not going to. He wasn’t talking about a ‘generation’ almost 2000 years after he lived. He was certain the Kingdom of God was coming to his time and his people. All of these convoluted and ultimately unconvincing explanations of what he ‘really’ meant when he preached an imminent heavenly Kingdom on earth simply won’t do. While mainstream Christians mock Jehovah’s Witnesses for their silly conjecturing about Jesus’ return, they share the belief Jesus is coming back. Most won’t venture a date (though there have been plenty who have) because, they will tell you, Jesus also said ‘no-one knows the precise day or hour’ when the Son of Man and the Kingdom will appear (Mark 13.32). Nevertheless, they remain certain that Jesus will return: this year, next year, sometime… any time other than that which he actually predicted. While evangelical Christians and others insist that the bible, where all Jesus’ failed prophecies appear, is the literal and infallible word of God, they refuse to take literally his pronouncements about the coming of the Kingdom. While he might have said he didn’t know exactly when it would arrive, he was certain it would be while his own generation lived. As he is made to say in Matthew 16.28, ‘some who are standing here will not taste death before they see the Son of Man coming in his kingdom’. All of which is a problem for Christians: if these predictions are not to be ignored, then they must be interpreted, explained and, eventually, explained away. The last thing believers want to do is accept them for what they are; the demonstration of Jesus’ failure. The Kingdom didn’t arrive when he said it would and, given how far it is past its sell-by date, it’s certainly won’t be now.